Attention writers! Join us every Tuesday afternoon from 5-7 PM. We will workshop our writing during each session. Join us to help celebrate National Poetry Month. We will be honoring the life and work of poet Mary Oliver, by reading her work, and showing two brief videos of her reading her poetry. Following the readings, we’ll have an Open Mic. Join Us For the Discussion: As Whitehead brilliantly re-creates the unique terrors for black people in the pre-Civil War era, his narrative seamlessly weaves the saga of America from the brutal importation of Africans to the unfulfilled promises of the present day. The library is closing early today Thursday April 11 due to the snowstorm. Due to weather conditions the library will close at 3pm today Tuesday 12. Another beautiful winter day in Bayfield! Support the Bayfield Public Library by participating in this run, walk or bicycle through Bayfield's scenic orchard area on Memorial Day weekend, Saturday, May 25th. This family event is open to all ages. Big BIG library news! Are you sitting down? We’ve been awarded an $80,000 grant from the Bremer Foundation for our pillar fund! What an honor! The challenge of this news is that, before we are given the money, we must provide $145,000. Click image to learn more! Taking Applications For New Poet Laureate! We are now taking applications for our next Poet Laureate of Bayfield! Are you interested in the position or know someone who is? Check out our Winter newsletter here! Chock full of helpful information and timely updates! The Winter Lecture Series is right around the corner. Four programs over four months: January-April. Plan To Attend BayCon on November 2nd & 3rd! Russell Community Club gives $1000 to the Bayfield Carnegie Library pillar restoration. This was the most challenging puzzle we've done at the Bayfield Carnegie Library. Apple Blossom Run Returns! Bicycle Ride Too! After a hiatus of seven years, Saturday, May 26th is the date set for the 31st annual Apple Blossom Run, a well-loved and important fund-raising event for our library. This year a bicycle ride will be added to the event. Our library made #5 in a list of best libraries in Wisconsin! Wow! Read or download the newsletter. Library of the Month: Bayfield Carnegie Library! 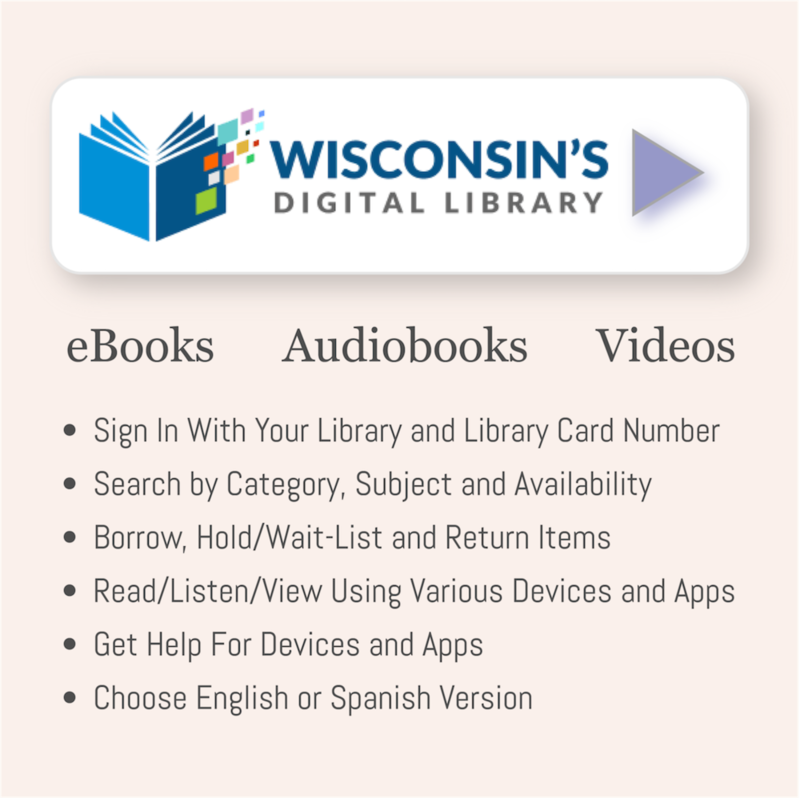 Each month, the BadgerLink team shines a spotlight on a library in Wisconsin, detailing that library's unique contributions to its community. The Library can expect income from the fund starting in 2017 once the principal has a chance to generate interest. Additional donations to the fund are always welcome and can be sent to the Bayfield Carnegie Library or directly to the Bayfield Carnegie Library Endowment Fund at the Duluth Superior Area Community Foundation, 222 E. Superior Street, Suite 302, Duluth, Minn. 55802. “The idea is to open the area up a little bit with some new shelving in several locations and to enhance the entryway with special books or things we want to promote, while at the same time respecting the library’s architectural integrity,” said Don Albrecht, Library Board President. Scroll with arrows at right. Our historic Carnegie library is a community legacy that enriches our lives in so many ways—both for year-round residents and for the many seasonal patrons who live here. Our mission is to be “a compass for curious minds”, providing books, DVDs, magazines, newspapers and Wi-Fi in an inclusive atmosphere. The library’s diverse programs strive to educate, entertain, and inspire people of all ages. The Bayfield Carnegie Library, built in 1904, is in need of major repairs including restoration and strengthening of our pillars, recovery of three chimneys, tuck-pointing of the brick, and improvement to the front steps. Estimated expenses for the pillars and other library repairs has a professional estimated project budget of $203,000. We are seeking funding support from the Bremer Foundation and other organizations. Our goal is to raise an additional $80,000. We have been actively fundraising for the Bayfield Carnegie Library pillar restoration for some time. To date, we have received $38,000 in donations for this project. This includes $15,000 in contribution from the City of Bayfield General Fund, and generous gifts from the library community of patrons and friends. We continue to search for other sources of revenue and would appreciate any contacts you may be able to provide in support of this project. The work will be done by experienced restoration contractors with oversight from the City of Bayfield and your Bayfield Carnegie Library Board. March 2019: To date, we have raised over $53,000 for the pillar fund. The total project cost for the pillars and other repairs—chimney, tuck pointing, painting, and retaining wall—is $203,000. We are also looking at other grant funder possibilities. Thanks to all who have supported this big campaign so far! Good News!! Click here to learn more about our grant/challenge from the Otto Bremer Foundation.